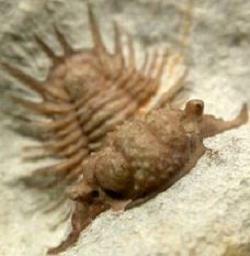 Conulariids are fossils of an extinct group that spanned Cambrian (possibly earlier, Ediacaran) to Late Triassic times. They are distinctive in that the individuals appear to have been protected within a four-sided, pyramid-shaped shell made from calcium phosphate rods arranged in rows or laminae. This is normally all that remains of the animal. 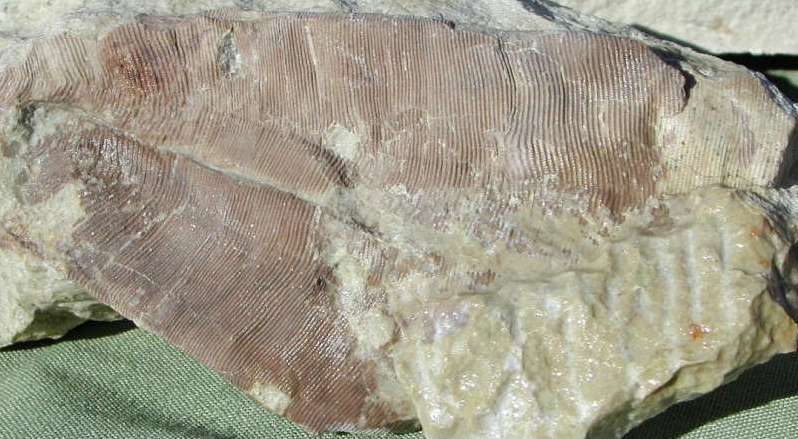 As the individual grew, new phosphate rods were added to the shell structure, giving the animal its segmented appearance. According to an entry in Wikipedia: "The prevailing reconstruction of the organism has it look superficially like a sea anemone sitting inside an angular, hard cone held perpendicular to the substrate." In other words, conulariids appear to have been Staurozoan, or stalked jellyfishes, but with a hard outer shell. In spite of their acknowledgement that "no conulariid fossils have yet been documented that indicate the existence of a pelagic or free-swimming life stage in this group," recent investigations by Marques, Collins and others, have led to the possibility that they were closer to the Coronatae (crown jellyfishes), an order within the Scyphozoans. These are commonly known as the "true" jellyfish, and they have two life phases: the conspicuous medusa or jellyfish form seen at beaches and aquariums, and an obscure, but longer-lived bottom-dwelling polyp, from which new individual medusa forms are periodically released. It is interesting that the Conulata have been found to be deeply nested within the Scyphozoa, and further that they are a sister group to the Coronatae, given that so little is actually known or can be inferred about these extinct creatures (other than symmetry, mode of life, segmented internal structure and their phospatic periderm). The relationship begs a question, did conulariids have a medusa form also? M.G. Simoes, L.H. Cruz de Mello, S.C. Rodrigues, J. de Moraes Leme & A.C. Marques 2000, Conulariid taphonomy as a tool in paleoenvironmental analysis, Revista Brasileira de Geociencias 30(4): 757-762. H. Van Iten, J. de Moraes Leme, M.G. Simoes, A.C. Marques & A.G. Collins 2006, Journal of Systematic Paleontology 4(2): 109-118.